A small group of five mountaineers consisting of Kroupis Nikolas, George Zardalidis, Apostolis Koufogazos, George Margaritis and Petros Tolias, organized a road trip in the Swiss Alps with the final aim to climb three peaks in these Valais valley, Weisshorn 4506m, the Weissmies 4016m and 4010m Lagginhorn. The mission lasted two weeks from 19 July to 2 August 2015 and moved drive by car and ferry from Igoumenitsa to Venice. 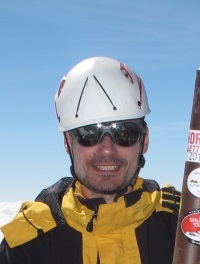 The initial objectives of the mission was to climb to the Weisshorn peak (4506m), from the east ridge (classic route) and more demanding crossing of Taschorn peak (4490m) and Dom (4545m), the sharp ridge. Due to the time frame the crossing was not carried out and instead made two ascents on peaks Weissmies (4016m) and Lagginhorn (4010m). 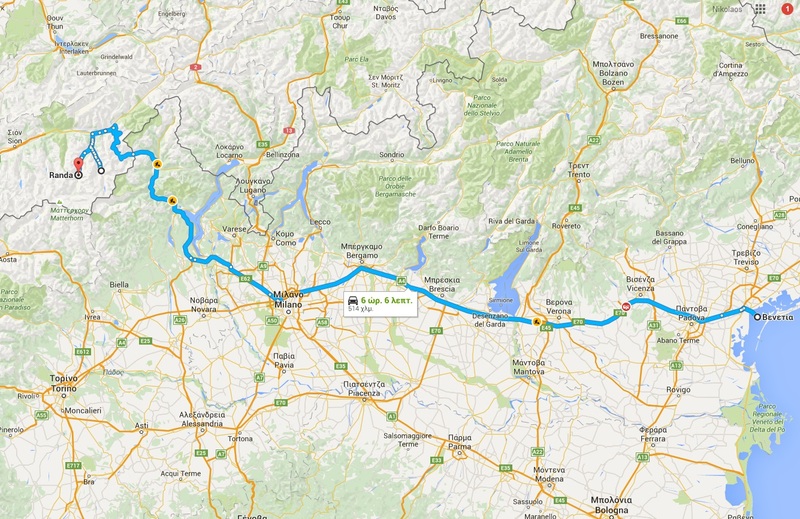 The group met and departed from Trikala, with two cars loaded with equipment, in the afternoon on July 19, 2015 to Igoumenitsa. The next morning was the embarkation and after 25 hours sluggishness arrived in Venice (Tuesday, July 21, 7:30). From Venice went to Milan, a city with commonplace the crowded peripheral highway where commonly there is traffic jump, especially during the summer months. After Milan we changed direction northwest to Switzerland and travel became easier and more beautiful because of the beautiful landscape approaching to Domodossola, a town near the border with Switzerland. At the border there was no control neither the Italian nor the Swiss side, and the road went uphill in most Swiss territory towards the Simplon Pass. The passage of the Simplon is a col at an altitude of 2005 meters leading to the valley of Valais, Switzerland. Going down to the valley, the two cars crossed the town of Brig. 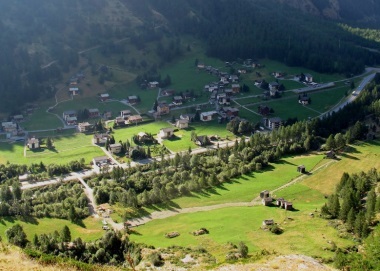 Immediately after arriving in Visp follow the road to the village of Randa, in the Zermatt valley, at an altitude of 1400 meters. After eight hours road trip the group spent the night at the campsite of Randa. To our great surprise we found that the same camp lived a 7-member group of climbers from Athens Mountaineering Club had just returned from a successful ascent to Dom (4545m). 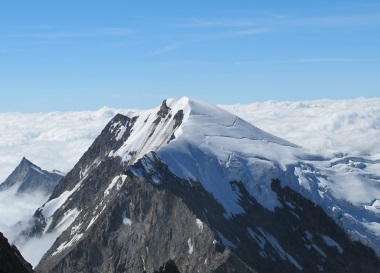 The morning of Wednesday July 22 with full camping load was climbing to Weisshornhutte shelter located east of the Weisshorn peak at an altitude of 2932m. Visitors trail starts from the village of Randa entrance. Initially it is very steep and passes through a forest of firs. The slopes on either side of the village is very steep, but the path meanders between vertical slopes until at an altitude of just over 2000 meters the forest thins. Higher the slopes are smoothers and are covered by dense undergrowth. After four and a half hours trekking, the group reached Weisshornhutte and went a little higher to the morena of the glacier Schali. At 3100 meters above sea level there is a place where can pitched about 3-4 tents where we make our camp onto rocky field. From this point we had beautiful views from all the way to the magnificent and demanding summit of Weisshorn. From here one can admire the perfect triangular pyramid with three ridges extending to the east, the west and the north while he realizes that is facing one of the most steep and arduous mountains of the Alps. 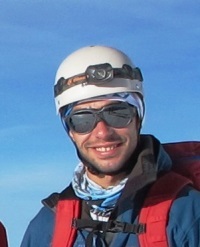 On the same day (Wednesday 22 July) two members of the group, George Margaritis and Apostolis Koufogazos, continued to climb higher in order to identify the route to the summit. After several hours of exploration efforts, they reached up to an altitude of 3430 meters. The next day, Thursday, July 23, four climbers began, while Apostolis remains in the camp, for further exploration and aimed to climb the pre-peak P3914. The climb started relatively late in the morning because of the rainy weather. As route chosen shorter, for the pre-peak, climbing up the central couloir (45 ° inclination) covered with frozen snow. At the altitude of 3540m we move left and continue the ascent from the rocky flat ridge that is leading to P3914m. The rock climbing begins from a small almost vertical section (III degree) which is commonly descanted with rappel. The route moves exclusively in rocky field. When climbing to the summit pre-identified the route of ascent after laborious searches on steep and unstable terrain, which resulted in many false detours significantly delaying the ascent. The correct way to P3914m requires relatively easy climbing up III- difficulty, the difficulty lies in finding the right path. Finally, after four hours climbing team reached the first target, which was the peak P3914m. The route after pre-summit (P3914m) continues on the eastern edge of the spine and is quite technical and also exposed. It takes us two and a half hours to return from the pre-summit P3914m, while when we descent, we record the route on GPS that can be easily follow the route on summit day. Friday, July 24 was a rest and preparation day for the planed climb to the summit the next day. The main objective difficulties of such a mountain is the route finding and the weather. 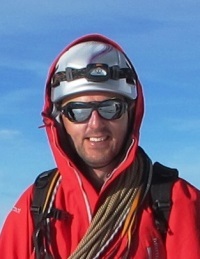 The most climbers are attempting Weisshorn with a mountain guide. 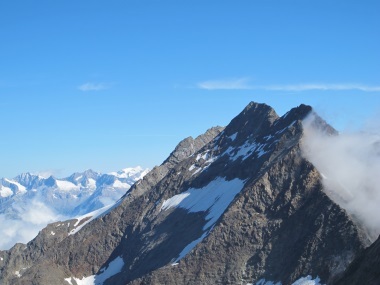 Due to the bad weather we cancel our scheduled attempt to Weisshorn on 25th July. We run out of food because we had spent already 4 days in camp, but we still our minds want to continue climb the peak. Weisshornhutte is a small hut with 30 beds, which is managed from a 70 year old man and his daughter (Katerina), this year was the 49th year that operating the hut. Both were extremely welcoming and helpful giving us info about the weather forecast any farther help. Note that the hut has 30 people capacity and very few people visit the mountain due to the difficulty. Weisshornhutte is only open for seven weeks during the summer. Everything was ready for the ascent on Friday night, but the weather spoiled by winds and storm late Saturday morning. So the climb was postponed for next Sunday July 26, while the group remained stuck in the camp for one more day. At 01:00 after midnight, Sunday, July 26, the group of Kroupis, Margaritis, Tolias and Koufogazos departed from the camp and after three hours reached the pre-peak P3914m even before the sunrise. We climb up to peak P3914m without using a rope and security. After the P3914m we roped together and continue with parallel movement, starting to climb the rocky ridge of the eastern ridge. The main feature of the ridge is constant and exposed passages III degree of difficulty. Along the vertical towers are several measures of which usually we go up while two characteristic towers bypassed by either right or left. The expansion of the rocky ridge is about 500 meters by 220 meters altitude difference (ascent). At the edge there are some great belays for abseiling on descent, which helps climbers to move faster. The ridge continues even closer with snow and frames (at an altitude of 4100 meters) and higher up the slope increases reaching 50 degrees. 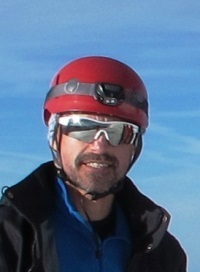 The high altitude acted in most members of the team with headaches as we approaching the summit. 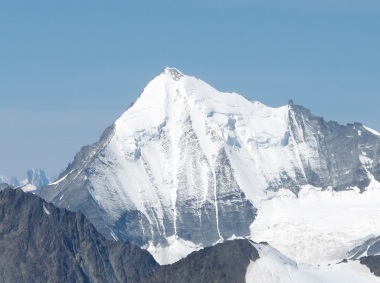 The weather was perfect with sunshine and with no wind, while on the same day they reached the summit of another 18 climbers, unusual for Weisshorn. We reach the rocky pyramid peak after 8 hours of ascent, the four climbers reached the top of Weisshorn at 09:00 which is positioned a large metallic cross. The views of countless Alpine peaks was indescribable, and adjacent summits as Zinalrothorn, Dent Blance and Matterhorn raised as towers and stood out from the others. Looking east forward by the group of the Mischabel peaks along with the pair of Dom-Taschorn peaks are among the highest in Switzerland. The return was made by the same route while moving and making a total of four rappels, three in three towers on the eastern ridge and one on the base of P3914m. After the fifteen hours on the mountain the four members returned at 16:30 at the camp and celebrated the success with a meal at the Weisshornhutte. Monday morning July 27th the temperature had dropped down many degrees below zero in the camp and everything was frozen. Two climbers attempting the previous day to climb the west ridge of the Weisshorn stacked in slope. The afternoon storm and blizzard did not allow the helicopter to rescue them and ultimately themselves managed to reach the summit at night. Low temperatures do not allow them to stop, so followed the eastern ridge, which had risen to descend from the mountain. Finally early in the morning they arrive in the pre-peak P3914m. The rescue helicopter picked them up the next morning and return to Randa in a few minutes. In the morning we picked up the camp and begin the descent back Randa village. It took us about 4 hours to reach Randa and we stay there for the next two nights in the camping. The next day we visited Zermatt, a town which is the biggest center of mountain sports in Switzerland and this year celebrated the 150th anniversary of the first ascent of the mythical Matterhorn mountain. The arch of the Matterhorn rises imposingly in the depth of the Zermatt valley, while the shape of the mountain is the symbol. The Zermatt has many shops and hotels for the thousands of visitors that coming every day from every corner of the world. Wednesday morning we move from Randa to Saas valley which is located about 40 km from Randa and planning to climb the summits Weissmiess and Lagginhorn. We camp at the campsite Kapellenweg one of three camping in Saas-Grund village (1500m altitude). None of the villages have space for free parking so guests will necessarily to park their vehicles either in the public parking or in private places such as camping and always have to pay for parking. The accesses to the peaks, surrounding Saas valley, is possible by using cable car, saving time and effort. After using the cable car the total ascent to the summit is about 1000m altitude and easily can do it in a day. So Thursday, July 30 the group traveled on foot from the camp, to the base of the cable car in the center of the village Saas Grund. The aim of this day was to climb Mount Weissmies to 4016 meters altitude. The name of Weissmies mountain is complex and results from the words white moss, because the mountain is covered with many glaciers and hanging seracs, and looks like a large moss with white color. By using two cable cars we reached the Hohsaas base at 3120 meters passing from intermediate stop in Kreuzboden (2240m). Within a few hundred meters from the Hohsaas base is the glacier Trift. To climb Wiessmies followed the classic route crosses the glacier Trift and approached the peak from the southwest ridge. Crossing glacier and climbing to the summit have many dangerous crevasses but easy pass them jumping over them. 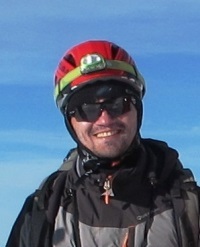 During the ascent met many climbers since the mountain is of medium difficulty and requires no special technical skills. After a very quick ascent, just two and a half hours, all members of our team stood at the summit of Weissmies. The day was very clean and the view of the endless peaks of indescribable Alps. The return was even faster following the well etched path on the glacier. Early at the afternoon, the group returned safely back to Hohsaas base and look for the route to ascent Lagginhorn which is located nearby. Friday, July 31 using the same cable we reach the base Hohsaas. This time we move to the north. First, the path is descending and traversing the rocky slopes of Lagginhorn in order to reach the west ridge, crossing first a small glacier. In traverse, the path crosses a steep rocky ramp where a via ferrata equipment are placed, for safe passage to the small glacier Lagginhorn. Crossing the small and stable glacier in the west of the peak we climbed the rocky western ridge of Lagginhorn. The ridge is relatively easy but over 3500 meters altitude, the ridge is continually difficulty I-II. After three hours climbing all mountaineers stood on the rocky summit of Lagginhorn, where we met some more climbers. Following the same route in the afternoon we returned back to base Hohsaas from there by cable car went down the village Saas-Grund. Next morning we must be in Venice for boarding into the boat. Such, when we return from the mountain directly pack the equipments and leave from Saas Grud. We continues drive to Venice. Late at night we stop in a parking of the highway Milano-Venice for sleep. The next day, Saturday before noon, arrived in Venice harbor and boarded the return ferry to Igoumenitsa. Sunday evening tired but completely satisfied the five friends arrived in Greece after the successful ascent of three peaks 4000 meters of the Alps, with the main Weisshorn, which is one of the most high, difficult and challenging Alpine peaks. Dr Electrical & Computer Eng.